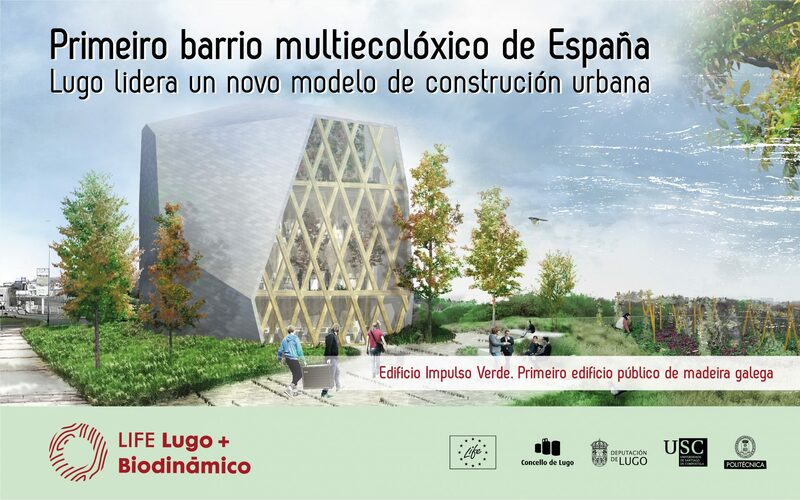 Yesterday the Concello de Lugo, one of the partners of the project, made the release to the press of the first step for the development of the multi-ecological neighborhood planned in the actions of LIFE Lugo + Biodinámico. What will be the first multi-ecological neighborhood in Spain contemplates a series of actions such as the construction of houses built structurally in wood, the collection of rainwater for reuse in the irrigation of the green zones, and the implantation of a system of reuse of the garbage reconverted to biomass. Energy saving measures will also be applied with the reorientation of the roads and a recovery of the green areas with native species. In addition, this space is expected to build the first public building in Galicia built with Galician wood, Impulso Verde. The planning of the solutions will be established according to their own microclimate, derived from conditions such as height, slope or the incidence of sun and wind. This will achieve Climate Comfort zones: resilient, energy efficient and prepared to extreme temperatures and to avoid flooding from torrential rains. On our website is all the information on the actions to be developed in this environment.